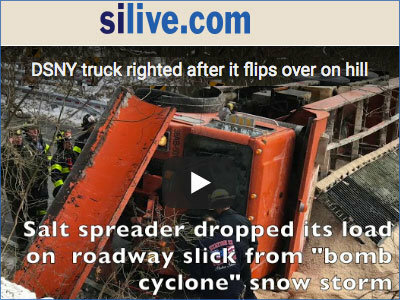 A video on SILive.com shows a flipped salt spreader being righted. A DSNY worker with 10 years on the job is reported to have suffered neck & back pain and was taken to an area hospital after the accident. The worker was the truck’s driver and the only occupant of a salt spreader which hit an icy spot, tipped over and came to rest on its side.